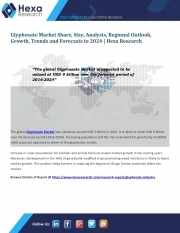 Description of "Glyphosate Market Share, Application Analysis and Forecasts, 2016 to 2024 (eBook)"
The global glyphosate market is expected to be valued at USD 9 billion over the forecast period of 2016-2024. Surging demand for (GM) genetically modified crops is expected to remain a key driver for the market. Growing population coupled with augmented crop consumption in bio-fuel and as well as in animal feed is anticipated to fuel the genetically modified crops market. Increasing demand for no-tillage and minimum tillage system is expected to boost the demand. Reviews of "Glyphosate Market Share, Application Analysis and Forecasts, 2016 to 2024 (eBook)"